(From Panasonic lens literature) Panasonic has announced that it has updated the LUMIX G telephoto zoom lens based on the Micro Four Thirds system standard. In addition to the versatile zoom range from wide-angle to telephoto, the new LUMIX G VARIO 14-140mm / F3.5-5.6 II ASPH. / POWER O.I.S. (H-FSA14140) features a splash/dust-resistant* construction for heavy field use yet retains its stylishly compact profile remains lightweight. The POWER O.I.S. (Optical Image Stabilizer) effectively compensates for not only small, fast movements, but also large, slow movements, making it easy to shoot super clear shots even in low-lit situations at nighttime or indoors. Incorporating an inner focus drive system and stepping motor, the new LUMIX G VARIO 14-140mm / F3.5-5.6 II ASPH. / POWER O.I.S. is capable of smooth, silent operation to work with the camera's high-speed, high-precision contrast AF system for both photo and video recording. It is also compatible with the sensor drive at max.240 fps to take maximum advantage of cameras with high-speed AF. The LUMIX G VARIO 14-140mm will be available at valued channel partners in May 2019 for US$599.99. 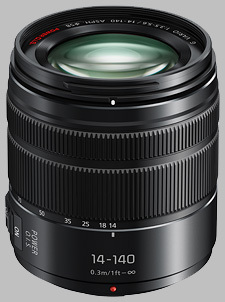 The Panasonic 14-140mm f/3.5-5.6 II ASPH POWER OIS LUMIX G VARIO doesn't have any user reviews yet!